After a momentary break, it’s time to get back to some Brubeck, the reason why I began this website! This is one of those rarer bootleg albums, where the information surrounding the recording is actually pretty well-documented. It’s the album pressing itself that is confusing and unclear. With that, on to the music we go! This bootleg recording features the Brubeck Quartet performing at the 1966 Newport Jazz Festival before an appreciative audience. Also headlining that year was Miles Davis’ group, John Coltrane, Stan Getz, Archie Shepp, and a young George Benson, with appearances by Grant Green, Kenny Burrell, Billy Taylor, and Duke Ellington, among others. Imagine a four-day weekend of live jazz with a lineup like that! Mercy. Recordings from that year’s festival have turned up here and there, probably stemming from taped radio broadcasts from Voice of America. On the opening night of July 1, the moon was full, the night was warm, and the Dave Brubeck Quartet was smoking, with Brubeck in particularly rare form. Perhaps spurred on by the crowd, the group powered through a setlist consisting of mostly originals. I say this all the time, but it truly was hard picking one track to feature; there’s just so much going on musically on this set! 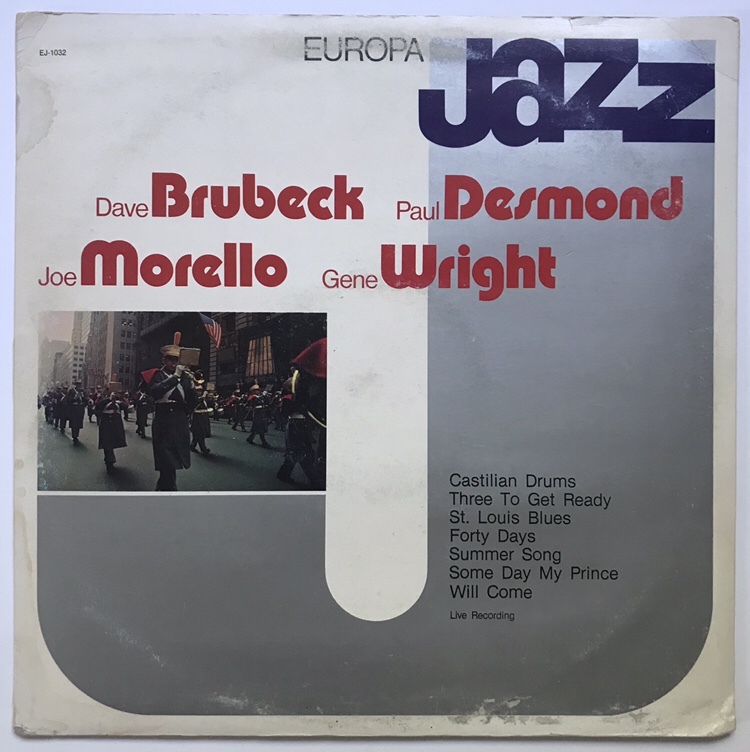 While Desmond is well-known and praised for his use of musical quotes and references, Brubeck gets in on the action as well on almost each track. For instance, during his solo on “St. Louis Blues” (the group’s standard set opener), Brubeck throws in a lengthy quote of “Stella By Starlight” before continuing with his solo. On the next tune, “Three To Get Ready” (from their album ‘Time Out’), Brubeck swiftly moves from the happy key of C-major to the more moody key C-minor and after building his solo, works in another lengthy quote, this time from the old old tune “St. James Infirmary”. Brubeck was just getting warmed up. After rearranging the piano during his solo on “Someday My Prince Will Come”, Brubeck reached back into his mental musical encyclopedia, dusted off another old tune, and managed to fit in a liberal dose of Nat King Cole’s “Hit That Jive, Jack” in his last chorus before taking the tune out. The highlight of the evening, however, comes from the most quiet and languid tune of the night. After setting a pastoral mood on the piano on his original tune “Softly, William, Softly”, Paul Desmond sails in on his lithe alto and proceeds to blow some of the most beautiful music of the set. It’s as Desmond finishes his solo that the magic begins. While Desmond plays his closing phrase, somebody just off-stage yells “Hey Dave, “Camptown Races””. Dave proceeds to open his solo with a slight figure before going right into the melody of “Camptown Races”, even adding some somber yet harmonically appropriate chords to fit the “doo dah, doo dah” part. It’s a remarkable example of how quick and humorous Brubeck could be on the fly, possibly surpassing the time Brubeck was performing at another outdoor jazz festival on the opposite coast when he pulled a similarly spontaneous stunt. Paul Desmond gets some nice playing here on this set, and while I’m sure he was tossing out quotes, too, I only caught and recognized the tune “I’ll Take Romance” on “Someday My Prince Will Come”. In the almost ten years since Brubeck first introduced the tune into the jazz songbook in 1957, the tune had been championed by artists as diverse as Miles Davis and Bill Evans, and the Brubeck Quartet show that the tune still had mileage left in it. Three of the tunes on the set list are from Brubeck’s then-current album ‘Time In’, of which only “Forty Days” is the only song that became a Brubeckian standard and added to his band’s book. The other tunes, equally beautiful if not more compositionally interesting, were all too rarely performed live and caught on tape. “Cassandra” in particular is an attractive tune that’s both quite unlike most of Brubeck’s original tunes yet extremely Brubeckian in that it features some polyrhythmic three against four during the bridge. It’s a track that I wish Brubeck had performed more frequently. Unlike the studio version, Desmond and Brubeck get more than one chorus to solo before Morello trades fours with Brubeck. 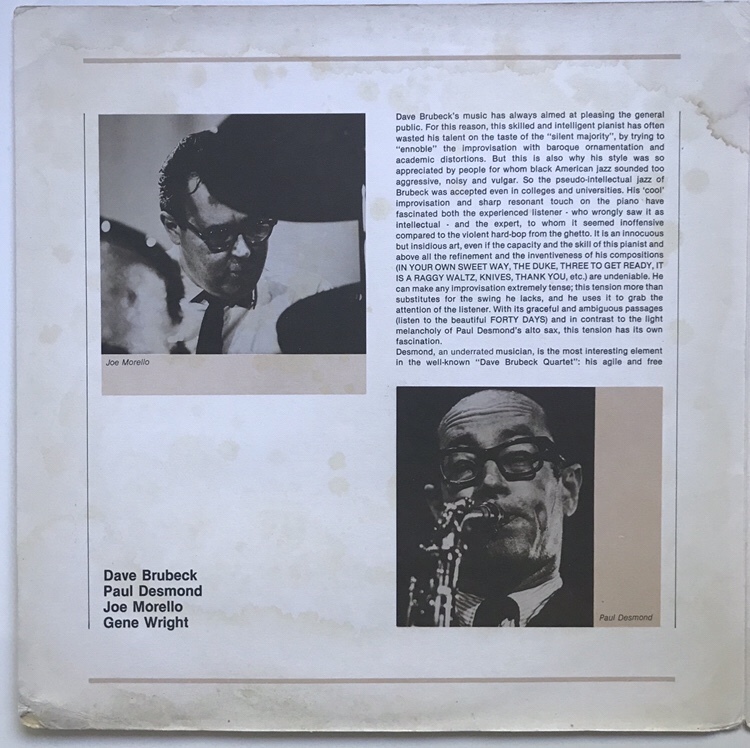 All in all, this recording shows that, despite the somewhat tired-sounding studio albums Dave Brubeck made in the 1960’s, the group was far from tired when in front of an audience. To be fair, this is a bootleg album, so you can’t really expect much. And yet, I’m still slightly annoyed with the album cover. What’s the name of the album? Is it Europa Jazz, which also happens to be the record label? What does a marching band have to do with the music? And if you forgot that this was a bootleg, the track listing has some incorrect titles. “Cassandra” was mislabeled as”Castillian Drums”, a drum feature for Joe Morello. Another frequent mistake was labeling “Softly, William, Softly” incorrectly as “Summer Song”, which happened here. These mistakes have wrecked havoc on numerous albums and discographies. More on that in a minute. While I’m sure there is stiff competition, these liner notes are among the absolute worst, most contemptuous, wildly untrue liners ever written for a jazz album. Warning: What follows is an extensive breakdown of these libelous liner notes. Feel free to skip to the next section if liner note smackdowns are not your thing. My feelings won’t be hurt. Right out the gate, there’s a blatant lie. “Dave Brubeck’s music has always aimed at pleasing the general public.” Wow. You don’t have to be a Brubeck fan to acknowledge that he most certainly was an individualist who did what he liked with no regard for pleasing the masses. He lucked out that his unique sound plus the talents of Paul Desmond happened to find a large audience in spite of himself. To say otherwise is just false. The liner notes are rife with these types of insulting and false statements. After reading disparaging remark after disparaging remark about Brubeck, one wonders why this person even bothered to write the liners if he didn’t have anything nice to say about it. It’s like getting a Klansman to write the liner notes to a hiphop album. The writer is a Paul Desmond fan, however, and dedicates much ink to praise Desmond at the expense of Brubeck. The writer revives the oft-made yet untrue sentiment that without Desmond, Brubeck would have been nothing. Before Desmond even joined Brubeck’s group, Brubeck led a popular trio that was winning polls and selling records. Desmond is the one who would have been nothing without Brubeck. The writer, however, goes a step further and infers that Brubeck knew that he wasn’t a good jazz musician so he kept himself surrounded by great musicians to hide his lack of skill. Come on. Lastly, the writer ends his spiel with another convoluted opinion, but this time about Paul Desmond. I don’t even know what the “reality of black American jazz” is, but to say that he didn’t take risks is disrespectful. Any jazz musician worth their union card takes risks each time they play their instrument. Wisely, the writer didn’t include a name. These are truly the worst liner notes I’ve ever encountered. It’s things like this, though, that makes record collecting such a fascinating hobby. Even liner notes can be unorthodox and surprising. As a side-note, why isn’t there a picture of Eugene Wright? There was more than enough room for a shot of him, and they included everybody else, so what gives? The album gives the incorrect date of 1961 as the year when the music was recorded. As it goes with bootlegs, that’s not true. As mentioned above, the music was recorded 1966 at the Newport Jazz Festival in Rhode Island. Despite the fact that half of the tunes on this album weren’t recorded until late 1965, the 1961 date has been taken as law and thus has caused confusion and discord in the chroniclers of the Brubeck/Desmond discographies. Who is Europa Jazz, anyhow, other than a bootlegger? 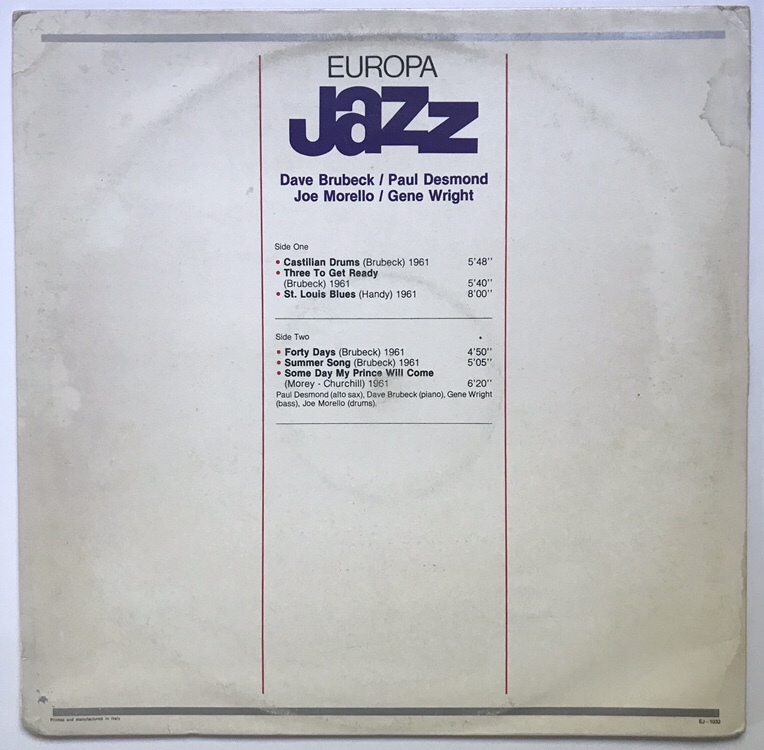 Digging around online, I discovered that Europa Jazz was part of a record label based out of Italy. This label included at least two other obscure sub-labels that, between 1981 and ’82, released a steady stream of mostly live unauthorized recordings of jazz. Much of the live recordings came from radio broadcasts of European concerts and festivals, but occasionally, American concerts and festival dates made their way onto the records, no doubt by way of Willis Conover’s jazz radio shows on Voice of America. Conover commonly taped the proceedings from the Newport Jazz Festival to broadcast later to Europe and Africa via Voice of America, and this album is almost definitely sourced from such a broadcast. The Library of Congress (LOC) in Washington D.C. holds many of these tapes, including this one. For a 1980’s pressing, the record is rather thick and heavy, with no deep groove. The record plays mostly quiet, sounding almost brand new. The recording itself sounds pretty good for a bootleg, recorded in glorious mono. Interestingly, the track list order has been rearranged. “St. Louis Blues” almost always was the opener, as it was the night this was recorded. Why the people switched it with “Cassandra” I don’t know. Another curiosity is that the record omits the set closer, “Take Five”. On the tape at the LOC, “Take Five” begins after the tune had already started. This may be why the tune wasn’t included on the record. For all the negative things that eBay can bring, one of the best things about it is that you can almost always find the record you’re looking for, and with luck, find that record being sold by someone who doesn’t truly appreciate what they have. Such was the case with this record. After a late-night discovery that this album was in fact a rare bootleg that had the near-complete Newport 1966 set from the Dave Brubeck Quartet, I quickly searched for it on the eBay. There were only two people selling it, one for a high-ish price, the other for a much lower price. Even better, the buyer was allowing offers to be made. I came in at slightly above half-price, which naturally ticked the guy off. After a stern counteroffer with an even more stern accompanying note, I was the proud new owner of another rare Brubeck record. I’ve picked up a couple of these albums, usually very cheap. Seems to be under the Giganti Del Jazz name too. I didn’t know the back story to this one, so I must keep an eye out for it now, thanks! The intrigue deepens! I recently grabbed two other records in this “series”, and they’re both records with a hodgepodge of live stuff by different people. This is an interesting label. Or labels! Quite. After reading your post I did or one of mine and did a bit of googling. It seems the two songs by Monk, credited as 1961 recordings are, in fact, Newport ’66, with a different line up to the liner notes. It’s a real lucky dip, it seems. This LP was put out by Armando Curcio Editore, a book publishing house in Italy. It was originally part of a series of no less than 100 LPs titled “I Giganti del Jazz” (The Giants of Jazz), of which this was Vol. 40. All of them had this same basic cover design, with a stock photo unrelated to the music on the front cover, but in place of the word “EUROPA” there are the words “CURCIO / I GIGANTI DEL”. 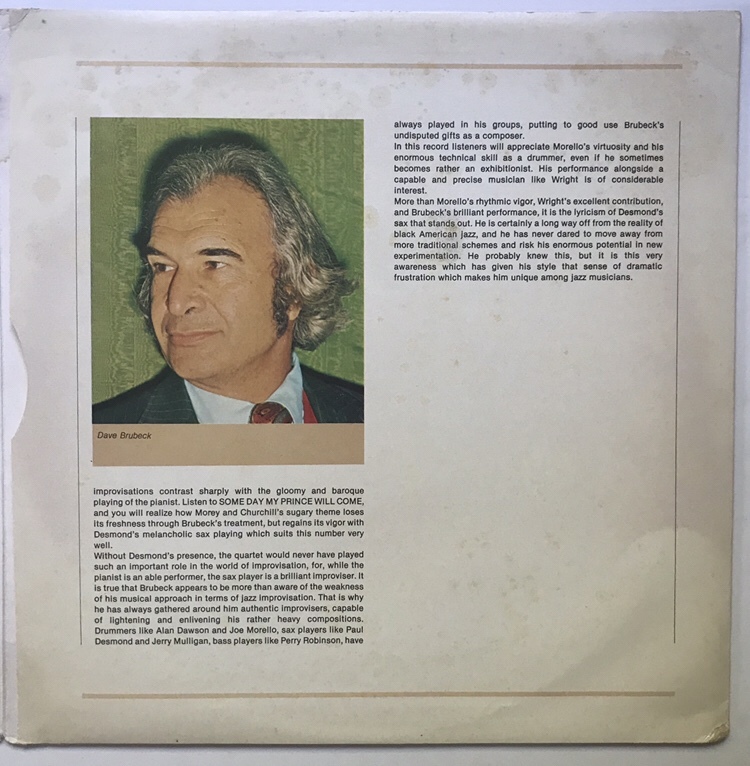 The liner notes on the Giganti versions are much longer, in Italian, and signed, in this case by the Brazilian-born music critic Gianni Morelenbaum Gualberto. The English notes on the Europa version are an extremely loose and extremely condensed translation of Gualberto’s notes. My reading knowledge of Italian comes via French, but as far as I can see, the Italian notes do not come across as quite as obnoxious. Not that they are at all good: the bizarre comments you quote are all present in some form, but when they’re surrounded by a lot of bloviation, it somehow softens their impact. In Finland, where I live, the Giganti LPs were everywhere in department stores and such in the 1980s, at dime-a-dozen prices, and they were an important part of my own introduction to jazz. It was only much later that I realised that the recording information on the live stuff was largely fictitious. But for some reason, they were always the Italian versions; this is the first time I’ve seen this “Europa” variation with English liner notes. Ah! Your knowledge and expertise on this topic is greatly appreciated. The insight about the liner notes and their intentions was particularly interesting, especially the political bent of the notes. It makes sense, though. Brubeck was seen as square, and I find myself defending him to some of my fellow jazz fans! I’d love to read the original notes to contrast with the English notes. I bought two other albums in the ‘Europa’ catalog, and they’re all sourced from live concerts. I’ll have to post them soon.